Dr Christine Dufès is a Senior Lecturer (Associate Professor) in Nanomedicine and Director of the Postgraduate School at the Strathclyde Institute of Pharmacy and Biomedical Sciences (SIPBS). She teaches on the Master of Pharmacy and on various MSc postgraduate degrees. Christine obtained a Doctorate in Pharmacy (with Distinction and congratulations of the Jury, 1997) and a PhD (with a European Label, Distinction and congratulations of the Jury, 2002) from the University of Poitiers (France). After four years as a post-doctoral researcher at the Cancer Research UK Beatson Laboratories in Glasgow, she was appointed as a Lecturer at SIPBS in 2006, obtained fellowship of the Higher Education Academy in 2007 and became a Senior Lecturer in 2012. Her research focuses on the development of targeted drug- and gene-based nanomedicines for cancer therapy and brain delivery. It resulted in 2 patents, 40+ peer-reviewed publications in high-impact journals such as Biomaterials and Journal of Controlled Release, 4 book chapters and attracted 1600+ citations (h-index: 17) (Web of Science). Christine has attracted over £2M in research funding. All her PhD students (from diverse backgrounds) submitted their theses within 3.5 years and are now further developing their careers in either Academia or Industry. Christine has been awarded the Bourse d’Excellence Lavoisier (2002), the Award of the 9th Annual Symposium of the United Kingdom and Ireland Controlled Release Society (2003), the Biochemical Journal Young Investigator Award (2009) and the Tom Gibson Memorial Award (2012) for her research. She also received the “Best Overall” Strathclyde Teaching Excellence Award (2013) for her teaching and was shortlisted in the category “Best in Faculty of Science” in 2015 and in 2018. She is a Trustee of the British Society of Nanomedicine, Senior Editor of Journal of Interdisciplinary Nanomedicine,Editorial Advisory Board member of Journal of Pharmaceutical Sciences and Member of the Editorial Boards of 5 journals (Journal of Nanotechnology: Nanomedicine & Nanobiotechnology, Pharmaceutical Nanotechnology, Pharmaceutics and Scientia Pharmaceutica). Dr Sukrut Somani obtained his Bachelor of Pharmacy (with Distinction) from Institute of Pharmacy, Nirma University (India) in 2010. In September 2010, he moved to The School of Pharmacy, University of London (now UCL School of Pharmacy) to pursue MSc in Drug delivery where he undertook a project determining haemocompatibilty of carbon-based nanomaterials under the supervision of Prof Kostas Kostarelos. In 2012, he joined University as a Research Assistant/ PhD student for developing polypropyleneimine dendrimer-based novel non-viral gene delivery systems for brain targeting. He was awarded "Best Poster" prize at Nanomedicine conference (Edinburgh, March 2014). After graduating in November 2015, he continued to work as a Postdoctoral Research Associate in the lab. Dr Partha Laskar obtained his Bachelor of Science in Chemistry (Honours) in 2006 and his MSc in Organic Chemistry in 2008 from the University of Calcutta (India). He then worked as a Research Chemist at Chembiotek, Kolkata, and as a Lecturer at Bhairab Ganguly College, Kolkata, for one year each respectively. He completed his PhD in Chemistry in 2016 from the Indian Institute of Technology Kharagpur on “Self-assembled Nanostructures of Novel PEG-Based Stimuli-sensitive Amphiphilic Random Copolymers as Drug Delivery Systems”. In 2016, he joined the University of Strathclyde as a Research Associate for the development of targeted nanomedicines to treat prostate cancer. He obtained two research fellowships (CSIR and DST) from the Government of India and was awarded "Best Poster" prize at CPL 2012 (IIT Guwahati, India), ICRRM 2013 (IIT Kharagpur, India) and ACCIS 2013 (NBU Darjeeling, India) during his doctoral study. Mr Intouch Sakpakdeejaroen obtained his B.Pharm from the Faculty of Pharmaceutical Science, Prince of Songkla University (Thailand) in 2006 and MSc in Medical Sciences at the Faculty of Medicine, Thammasat University (Thailand) in 2009, where he was awarded "Best Thesis" award. He became a lecturer at the Department of Applied Thai Traditional Medicine, Faculty of Medicine, Thammasat University, Thailand in 2009. He joined the group in 2015 and now works on the development of novel drug delivery systems for tumour targeting. Mr Jamal Almowalad obtained his Pharm.D degree from King Abdulaziz University (Saudi Arabia, 2009). He then joined Umm Al-Qura University as a teaching assistant at the college of Pharmacy. He moved to the US and received his Master of Science in Pharmaceutical Sciences from the University of Pittsburgh (USA, 2015). He joined the group as a PhD student in 2016 and now works on the development of novel gold nano-hybrids for multimodal cancer therapy. Miss Jitkasem Meewan obtained her B.Pharm. from Chiang Mai University (Thailand, 2006) and her MSc in Pharmaceutical Technology from Chulalongkorn University (Thailand, 2013). She worked as a pharmacist at Boots (Thailand) and as a Clinical Research Associate at Quintiles (Thailand) where she was a team member in conducting Phase III clinical trials in areas of vaccines, infectious diseases and systemic lupus erythematosus. Jitkasem moved to the UK and received her second MSc in Cancer Sciences from the University of Glasgow in 2016, before joining the group in 2017. She now works on the development of zein nanoparticles for biomedical applications. Dr Najla Altwaijry (PhD, 2018) is now a Lecturer and Head of the Department of Pharmaceutical Sciences at the College of Pharmacy, Princess Nourah bint Abdulrahman University, Riyadh (Kingdom of Saudi Arabia). Dr Joan Erebor (PhD, 2018) is now Lecturer in Pharmaceutics and Pharmaceutical Technology at the Faculty of Pharmacy, University of Benin (Nigeria). Mr Behin Sundara Raj (MPhil, 2008) is now a PhD student at Curtin University, Bentley (Australia). Dr Ju Yen Fu (PhD, 2010) is now a Researcher for the Malaysian Palm Oil Board of the Malaysian Government (Malaysia). Dr Hibah Aldawsari (PhD, 2011) is now Associate Professor of Pharmaceutics and Vice-Dean of Faculty of Pharmacy at King Abdulaziz University (Kingdom of Saudi Arabia). Dr Reatul Karim (MRes, 2013) is now a Assistant Professor at East West University, Dhaka (Bangladesh). Dr Majed Al Robaian (PhD, 2014) is a now Assistant Professor and Dean of the School of Pharmacy, Taif University (Kingdom of Saudi Arabia). 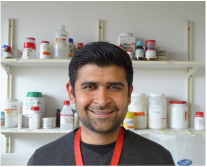 Dr Sukrut Somani (PhD, 2015) is now a Postdoctoral Research Associate in the laboratory.